If you're seeing an increase in spam and junk email, there are a number of ways to reduce the amount of unwanted email that lands in your inbox: mark it as spam, report it as phishing, or block the sender. In your message list, select the message or messages you want to mark as junk. 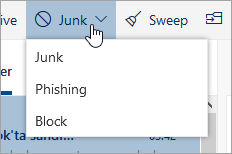 Select Junk > Junk to move the message to your Junk folder. Note: Items in your Junk Email folder are deleted after 30 days. Select an item to see when it will be deleted. To choose whether Outlook.com filters content from unknown senders or not, go to Junk email settings. If you discover that an email message was not junk, select the mail again (it will be in your Junk Email folder) and chose Not junk > Not junk. A phishing scam is an email that seems legitimate but is an attempt to get your personal information or steal your money. In your message list, select the message or messages you want to report as phishing. Select Junk > Phishing > Report to report the message sender. Note: Items marked as phishing scams are moved to your Deleted Items folder. Learn more about how to deal with abuse, phishing, or spoofing in Outlook.com. If you're receiving unwanted email, you can block the email addresses and domains you don't want to receive messages from. In your message list, select the message or messages from a sender you want to block. Select Junk > Block > OK. Note: Add any email address or domain to your blocked senders list to move these messages directly to your Junk Email folder. If you no longer want to block a sender, open your Junk email settings. Under Blocked senders, select the name or email address in the list and then select Remove . Select the arrow to see more. If you're receiving unwanted emails, you can block the people and domains from which you don't want to receive email messages. Add any email address or domain to your blocked senders list to send these emails directly to your Junk Email folder. You can also add email addresses or domains to your safe senders list if you always want to receive messages from those senders. Note: You can have up to 1,024 addresses or domains in the blocked senders and safe senders lists. If you want to add more than that, try blocking domains instead of individuals email addresses. Under Blocked senders or Blocked domains, enter the email address or domain that you want to block, and select Add. Tip: To edit or remove emails or domains from the Blocked senders list, select the item in the list and then select Edit or Remove . If you want to stop receiving newsletters or promotions, you can unsubscribe using Outlook.com. In your inbox, select a newsletter or promotional email. At the top of the reading pane, select Unsubscribe. Avoid posting your email address on your social networking site, in large Internet directories, and in job-posting websites. Don't even post it on your own website, unless you disguise it as described in "Disguise your email address", below. Select your Junk Email folder. Above the message list, select Empty folder. When you shop online, companies sometimes pre-select check boxes that indicate you agree that it's fine to sell or give your email address to responsible parties. If you don't want to receive email from those companies, make sure you clear the check boxes. When you post to a message board, newsgroup, chat room, or other public webpage, spell out your entire email address, for example, jerrifrye AT outlook DOT com. This way, a person can interpret your address, but the automated programs that spammers use often can't.